ŠKODA AUTO India introduces the new KODIAQ LAURIN & KLEMENT at an attractive introductory ex-showroom price of INR 35.99 lacs. 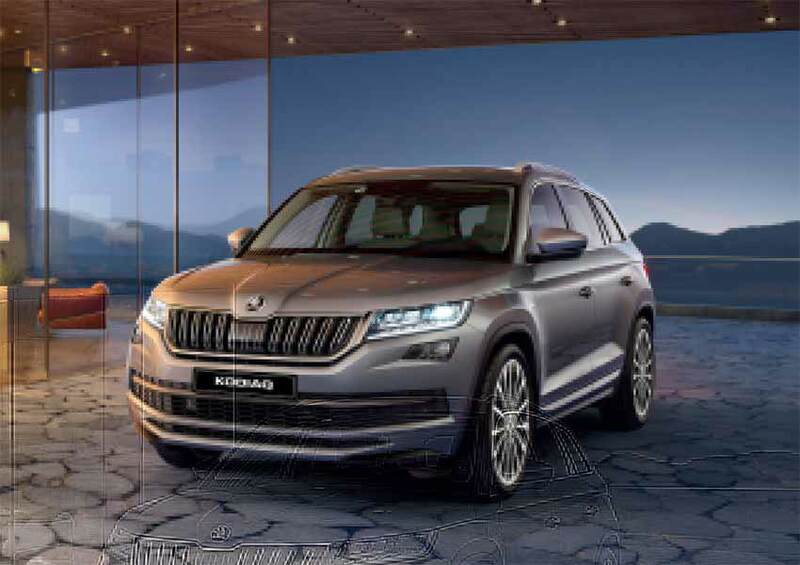 The KODIAQ marked the beginning of ŠKODA’s SUV campaign in India. The LAURIN & KLEMENT variant, with its characteristic design, extraordinary interior space, practical intelligence, and innovative technology, pushes the yardstick further. The original LAURIN & KLEMENT badge is a reminder of ŠKODA’s founding fathers. Their focus was on the highest level of craftsmanship, revolutionary technical design, and a personal approach to customers. And it’s fitting that the Czech brand flagship SUV, the ŠKODA KODIAQ, carry the name LAURIN & KLEMENT as a perfect testament to their predecessors’ legacy. The ŠKODA KODIAQ LAURIN & KLEMENT will be available in five colour options: Lava Blue, Quartz Grey, Moon White, Magic Black, and the all-new Magnetic Brown, across all authorized ŠKODA dealership facilities in the country. The KODIAQ LAURIN & KLEMENT’s individualistic exterior design and a plethora of distinctive features, are an arresting sight. The fascia is dominated by a distinctive chrome grille and the large SUV’s appearance is characterised by LED headlights with illuminated “eyelashes” and 18(R) Trinity alloy wheels. At the back, the KODIAQ LAURIN & KLEMENT dons crystalline elements in the ŠKODA-typical C-shape LED taillights. The chrome trim in the rear bumper borders the exhaust pipes and the diffuser. The silver roof rails intensify the premium feel of this ŠKODA SUV offering. The LAURIN & KLEMENT badge, sitting on the front wings like an artist’s signature on a fine painting, is tastefully complemented by the KODIAQ-embossed aluminium door sill scuff plates that entice you into the interior. Luxurious details and styling accents are found throughout the car. The decorative parts are black, reminiscent of piano lacquer, and are complemented by graceful chrome details. Elegant touches such as the LAURIN & KLEMENT logo on the stone beige leather upholstery, and the infotainment system home screen, are eye-catching and appreciated details. The most luxurious version of the KODIAQ offers such a wealth of standard that you won’t be wanting anything anymore. The 360° Surround Area View, with an array of four wide-angle cameras mounted on the front and the rear as well as the wing mirror covers, displays the immediate area surrounding the car on the infotainment system. The Hands-Free Parking minimizes the hassle of parking in tight spots by automatically selecting an appropriate parking place in a row of parallel or perpendicularly parked vehicles. In today’s crowded cities and space-starved streets, hands-free parking is a blessing indeed and needs a space 60 cm longer than the car itself when parking in parallel. The ŠKODA KODIAQ LAURIN & KLEMENT hosts the most technically advanced and intelligent connectivity features. The SUV opens up new vistas with the Virtual Cockpit: a customizable digital instrument panel that offers a fresh perspective of all important driving data and navigation. You can customize and control the same with the View button on the multifunctional steering wheel. The state-of-the-art eight-inch capacitive touch display in glass design reacts to the touch of a finger, not just to pressure; and is a part of the new generation Amundsen infotainment system developed by ŠKODA. The SmartLink+™ all-in-one technology integrates SmartGate™, alongside Apple CarPlay, Android Auto, and MirrorLink™, as standard. The premium Canton Sound system features 10 speakers, including subwoofer, and has a power output of 575 watts. New age connectivity solutions along with BossConnect™, integrated with the ŠKODA Media Command App, help occupants control functions like radio, music, and navigation from the comfort of the rear seat. The ‘Simply Clever’ features available in the KODIAQ LAURIN & KLEMENT are further proof that ŠKODA always offers a little bit ‘more car’ for your money – practical and convenient assistance in everyday life which is typical of the brand. These include, for example, Door-Edge Protection which deploys automatically when opening the car door and prevents the metal edge of the door from coming into contact with a garage wall or an adjacent car. When shutting the door, the trim folds itself back in. The protective elements on the front bumper prevent scratches to your car as well as the neighbouring vehicles. The ‘Simply Clever’ Power Nap Package of the ŠKODA KODIAQ LAURIN & KLEMENT will enable rear passengers to sleep soundly on a long journey. It includes variable headrests of the outer seats for a comfortably supported head posture while sleeping and two blankets. The KODIAQ LAURIN & KLEMENT also features a Digital Voice Enhancement feature, which transmits the driver’s and front passenger’s voice to the passengers in the rear via a microphone in the cockpit, thereby facilitating a smooth interaction among occupants. With the largest boot capacity within its class, the KODIAQ LAURIN & KLEMENT will never make you compromise on what you pack. The KODIAQ LAURIN & KLEMENT offers an impressive capacity of 270 litres, which extends to 2,005 litres with the rear seats folded down. That means ample room for all your business, pleasure and practical essentials. In addition, the Virtual Pedal enables a contact-free access. You can also adjust the upper position of the fifth door to suit your needs. The elegance of the ŠKODA KODIAQ LAURIN & KLEMENT is suitably accompanied by an impressive performance. The 2.0 TDI (4×4, AT) diesel engine generates 110 kW (150 PS) of power and 340 Nm of torque. The all-wheel-drive system with electronic control delivers a big increase in traction, stability, and safety. The all-wheel drive has an electronically controlled multi-plate clutch which allows the KODIAQ to venture off-road. The control unit constantly calculates the ideal driving torque for the rear axle. Any loss of traction is virtually eliminated due to a control system that is dependent on driving status. When the KODIAQ is cruising, the power is transmitted to the front axle thereby increasing the fuel efficiency. At ŠKODA, safety is a priority and not an option. Standard safety in the KODIAQ LAURIN & KLEMENT includes a wide range of features such as nine airbags: dual front, side airbags at front and rear, curtain airbags at front and rear, and driver knee airbag, which remains the segment benchmark. The car is equipped with iBuzz Fatigue Alert which detects signs of fatigue in the driver and prompts the driver to take a break. In addition, a host of security equipment and safety support functions include AFS (Adaptive Front light System), ABS (Anti-lock Braking System), ESC (Electronic Stability Control), EBD (Electronic Brake-force Distribution), MBA (Mechanical Brake Assist), MKB (Multi Collision Brake), HBA (Hydraulic Brake Assist), ASR (Anti Slip Regulation), and EDS (Electronic Differential Lock). The car also features the all-new state-of-the-art Anti-Theft alarm with interior monitoring, acoustic warning signal for overrun speed, engine immobiliser with floating code system, dual-tone warning horn, rear view camera with washer, exterior mirror and rear windscreen defogger with timer, Parktronic sensors at front and rear, underbody protective cover, and rough road package. ŠKODA announced its 4 year service care program which consists of a 4 year warranty program and a 4 year (24 x 7) Road Side Assistance which is standard on all ŠKODAs. Additionally, customers have an option to purchase a 4 year service package at a nominal price which ensures a hassle-free ownership experience.